Make birthday cards for kids with jungle-themed cutouts from the included printable pattern. 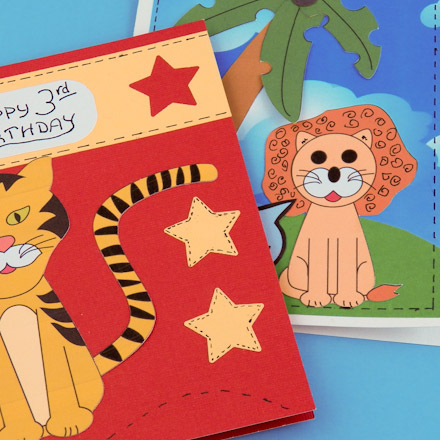 Follow the detailed instructions for a lion or tiger birthday card or use the cutouts and shape templates to make cards of your own design. The techniques for making cards with cutouts and stitching details are explained in the Paper Appliqué Cards tutorial. 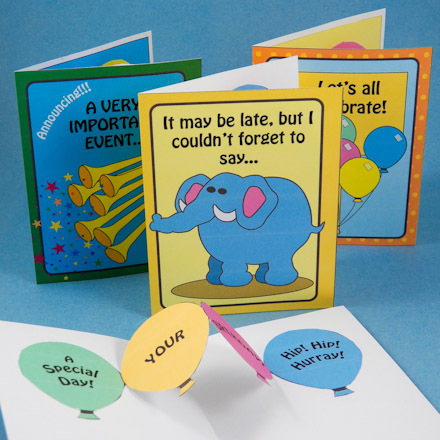 See this tutorial for detailed instructions, and if you are new to card making, review the Greeting Card Class tutorials for ideas and basic techniques. 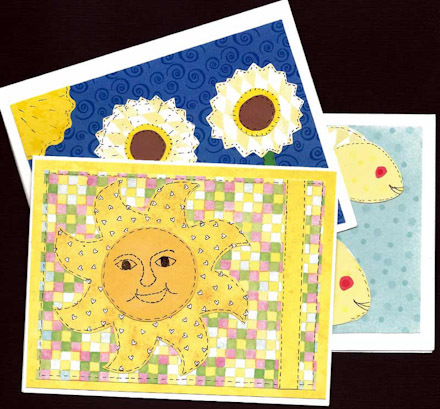 For how to make envelopes, see the Four Patch Cards tutorial or see the Envelopes to Make craft project for envelope templates and instructions. 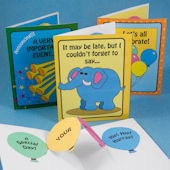 Scroll down to see the materials and instructions for both card designs. 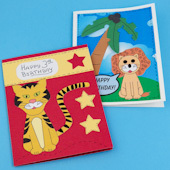 Both cards use cutouts from the jungle appliqués printable. Refer to the Paper Appliqué Cards tutorial for step-by-step instructions. Tip: Use the black & white Jungle templates if you want to cut the shapes from colored paper. Prep work: Cut a rectangle from the Clouds in blue sky ePaper that is 3¾" by 5". Cut a 3¾" by 1½" rectangle from the green paper or cardstock, and then cut a wavy edge on one long side. Punch three circles from the brown paper or cardstock—these are coconuts for the palm tree. Print the Jungle appliqués templates on white cardstock or paper. 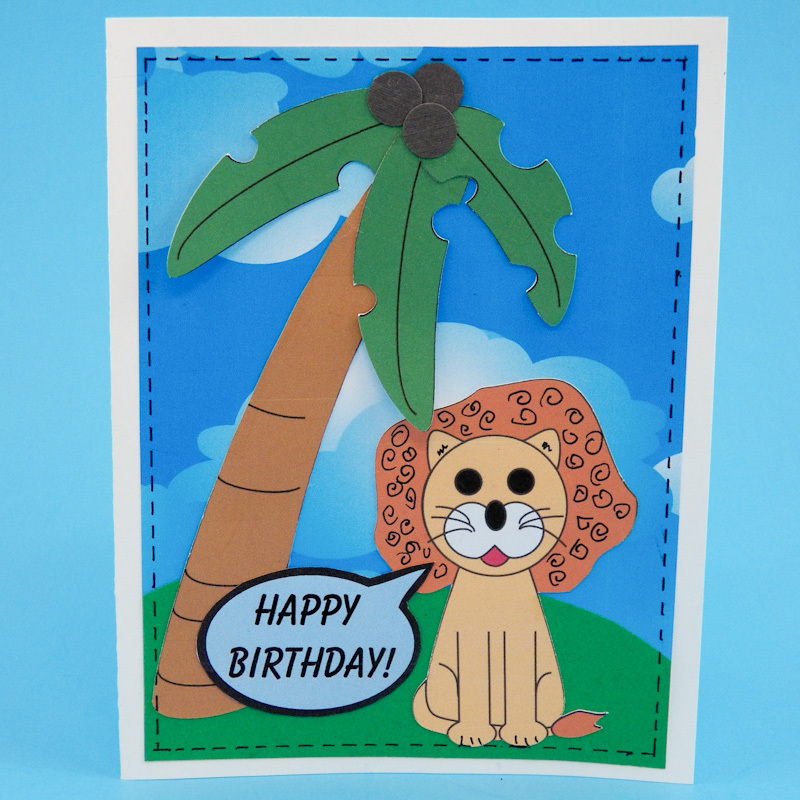 Cut out the smaller lion, palm tree trunk and leaves, and a message bubble. To make the card: Glue the green cutout at the bottom of the Clouds in blue sky rectangle to make the card background. Trim any excess paper to make straight sides. Glue the background on the card front. 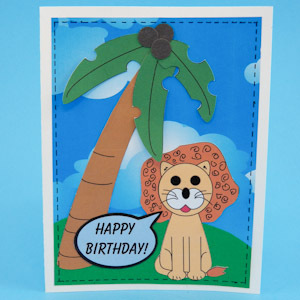 Glue the lion and palm tree cutouts on the card as pictured. The tips of the leaves can be left unglued. Glue the brown circle coconuts on the top of the palm tree and glue the message bubble as pictured. Write any message you like in the message bubble. Use the black fine-tip marker to add stitching lines around the edge of the background and to make curls on the lion's mane. See the Paper Appliqué Cards tutorial, step 4, for more stitching ideas and instructions. Prep work: Cut a 4¼" by 1¼" to 1½" rectangle from the yellow paper or cardstock. Punch a star near the right edge of the yellow rectangle, and punch one additional star from another piece of yellow. Print the Jungle appliqués templates on white cardstock or paper. Cut out the large tiger and matching tail. Cut a 1" by 2" rectangle from the leftover white paper or cardstock, and round the corners with your scissors. 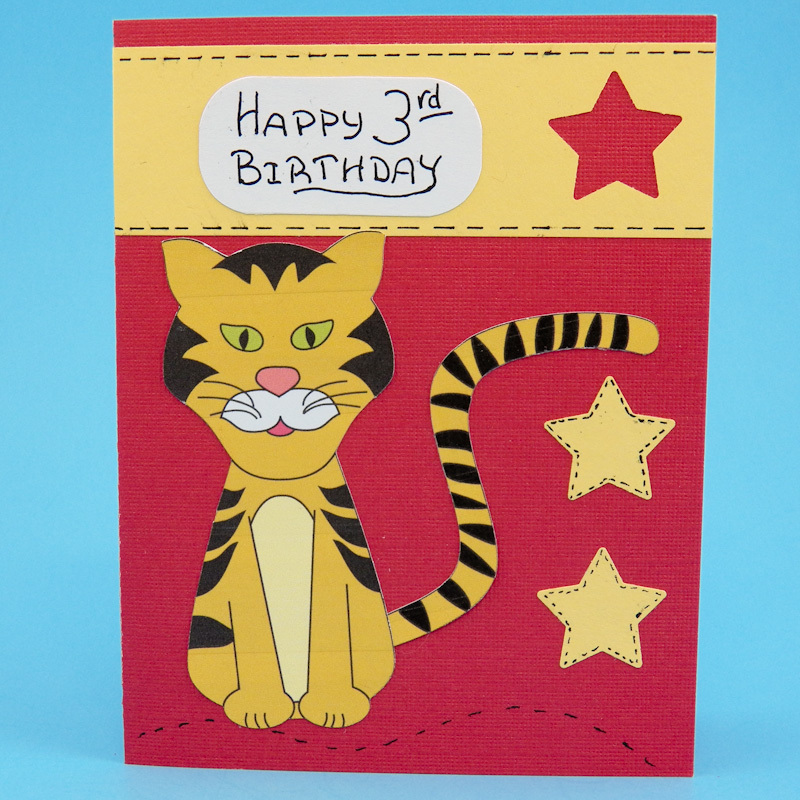 To make the card: Glue the yellow rectangle near the top of the card front. 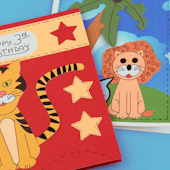 Glue the tiger, his tail, and the two star punches on the card front as pictured. Write a birthday message on the white rectangle, and glue it on the yellow strip. Use the black fine-tip marker to add stitching lines along the top and bottom edges of the yellow strip, around the edges of the stars, and draw a wavy stitch line cross the card under the tiger's paws. See the Paper Appliqué Cards tutorial, step 4, for more stitching ideas and instructions. That's it! Your birthday card is complete! 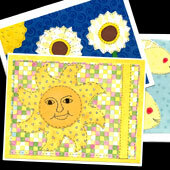 Related crafts: To make other cards with cutouts, see the Paper Appliqué Cards tutorial. Tip: Use the black fine-tip marker to enhance cutouts, borders, and backgrounds with "stitching" lines. 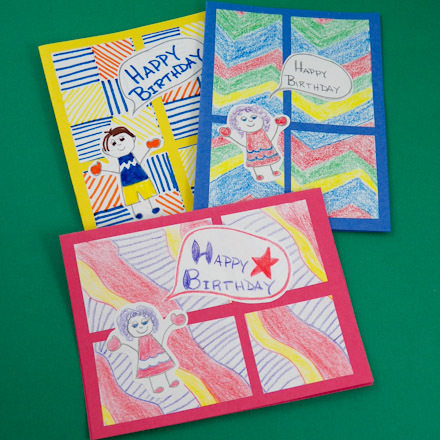 Related projects: For kid-friendly birthday cards to make, check out Kids' Four Patch Birthday Cards and Birthday and Party Pop-Up Cards. Also, see all the Greeting Cards Kids Can Make.